Evicting a family of squirrels from an attic is tricky if you're unwilling to call an exterminator -- yet rescuers with the Humane Wildlife Services recently reported success. How? First, they removed the baby squirrels from their nest, wedged in a corner of the attic, and placed them in a cardboard box. Next they tackled the hole in the roof that mama squirrel had been using to get in and out: By placing a one-way door over it, the rescuers ensured that once she made her exit she'd be barred from getting back in. From there, all they had to do is place the cardboard "reunion box" with her babies on the roof nearby, where mom could easily find them. 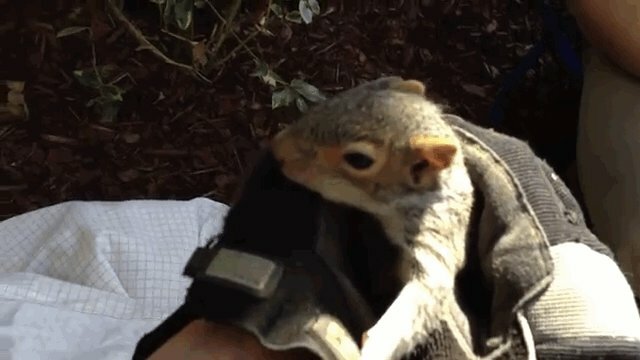 Within hours of this plan being implemented, the mother squirrel reacted exactly how the rescuers had predicted: She popped out onto the roof and jumped into the reunion box with her kids. From there she transferred them to a new nest in the neighborhood (this time a tree rather than an attic). Workers then sealed up the roof hole, ensuring that the homeowners wouldn't have to deal with new tenants.